Dongfang Electric has celebrated shipping the largest component it has ever made - the 1750 MWe generator destined for the Taishan 1 EPR under construction. 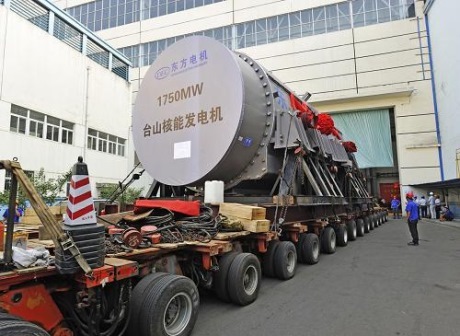 Claimed to be the world's largest single-piece electrical generator, the component will produce 1750 MWe gross when attached to the steam turbine driven by heat from the nuclear reactor of Taishan 1. Around 90 MWe of this power will be used by plant components such as the large pumps that circulate cooling water, leaving 1660 MWe net for supply to the grid. Taishan will have two such Areva EPR units, slated to begin operation in 2014 and 2015. The generators for other EPRs, under construction at Olkiluoto and Flamanville 3 are rated at 1720 MWe gross. Those units have nameplate net capacity of 1600 and 1650 MWe net respectively. Wheeling the component from its Deyang factory in central Sichuan province, Dongfang said its manufacture was by far the most technically difficult job it had carried out in terms of structural complexity as well as its size and weight.